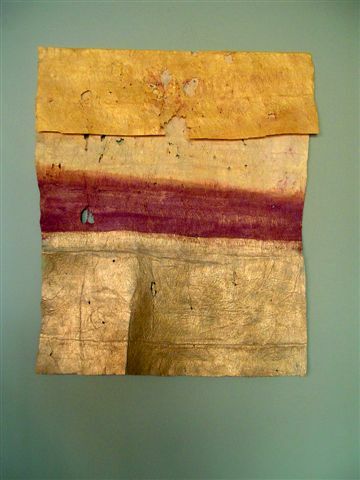 Georgia Sartoris has worked as an artist since 1972, with 22 solo exhibitions. 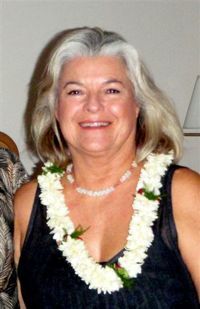 Her work has been exhibited in Artists of Hawaii at the Academy of Arts, Hawaii Artist Craftsmen Annual Exhibition, the Denver Art Museum, the Tweed Museum, and the Aspen Center for the Arts. Hawaii State Foundation for the Arts recently purchased both a kapa painting and a Hue Wai for the Hawaii State Art Museum. 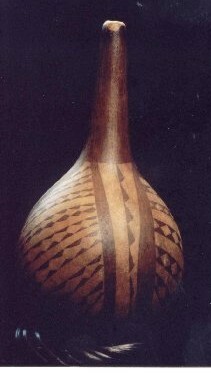 The Hue Wai Pawehe is the traditional Hawaiian water gourd. 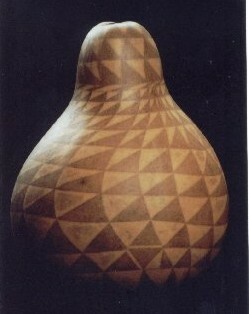 Most of the storage containers used in ancient times were gourds and a few of these were decorated with a pattern dyed into the shell of the gourd. I continue this tradition, growing the genetically true Hawaiian gourd and dying them in a long and painstaking process. 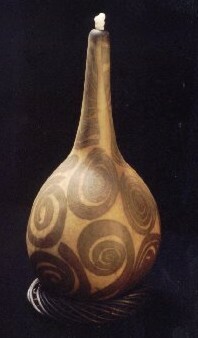 The designs are a personal statement about pacific culture and Hawaii. For the kapa paintings, the beautiful natural surface and shapes of the pounded-bark cloth as it emerges from the plant, without alteration, guides the surface design. I buy the bark-cloth from both Samoa and Tonga, and count myself so fortunate to find this wonderful artists’ material available in the modern world. My goal for both materials is to connect the traditional craft and natural material to a contemporary expression.